Now 3 days of testing the automated trading bot Butterbot have passed and in the last 24 hours the bot has done another trade, selling our 0.030 BTC in the BTC-e exchange when the exchange rate BTC/USD started to drop down. As a result our BTC-e account currently holds 25.2104 USD and the bot is waiting for signs for rise in the exchange rate, so that it can purchase BTC again. At this point in time, after the bot making two trades on the BTC-e exchange automatically we can calculate that we have made a few cents profit with the current exchange rate. Meanwhile we have already started to get a hand of the settings and are trying to get better results than with the recommended startup settings we’ve got. We have also decided to extend the testing on the MtGox exchange as well, so we’ve sent 0.04 BTC in our account there and set the recommended startup trading settings for that exchange to see how things will progress there. 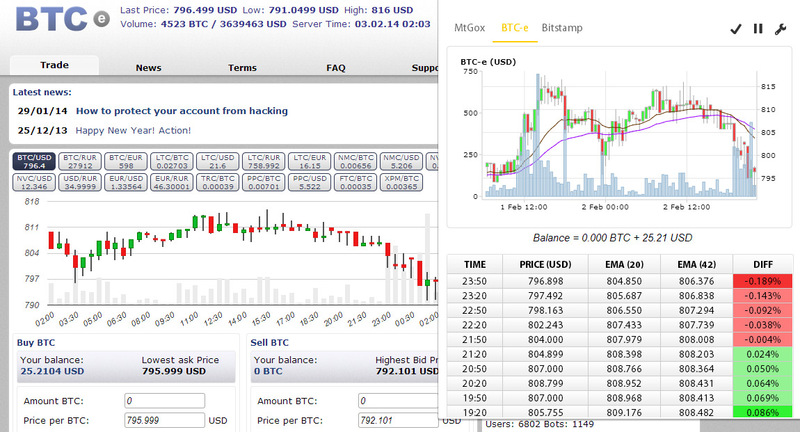 So far the bot has not yet executed a single trade on the MtGox exchange. But we are going to see how things will progress on that BTC exchange as well, so stay tuned for more reports on our testing of the Butterbot automated Bitcoin trading bot. The second day of our testing of the automated Bitcoin trading bot Butterbot is now over and while in the last 24 hours there was a bit more movement on the BTC-e exchange that we are testing the bot on, still Butterbot hasn’t executed even a single trade. 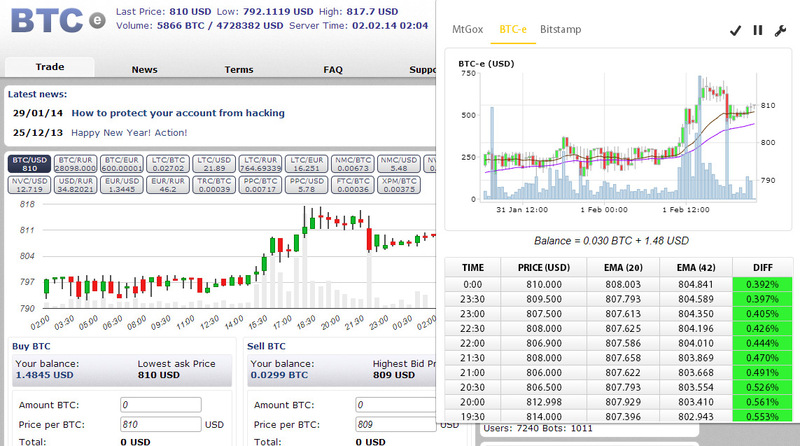 Our balance remains the same as yesterday, 0.030 BTC + 1.48 USD. Hopefully we are going to see more happening in the next day and the bot might actually do some trades and generate a profit, so stay tuned for our next report in 24 hours after another day passes. 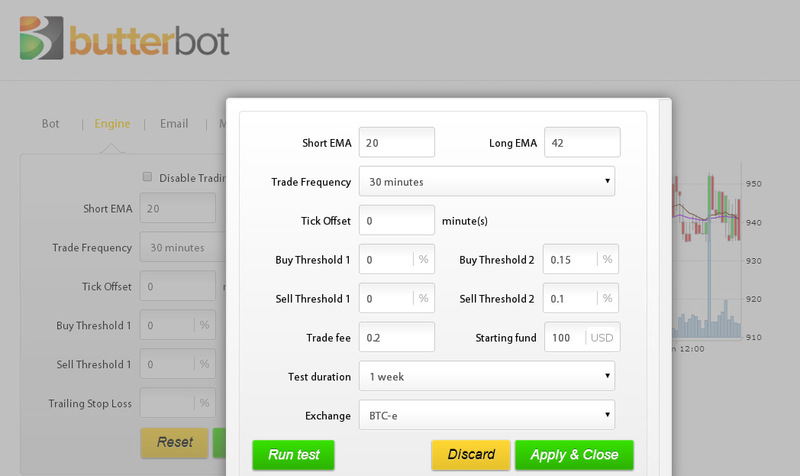 Butterbot is one of the few available automated trading bots for Bitcoin (BTC) trading based on EMA (Exponential Moving Average) logic that professional currency traders use. It is in the form of a Google Chrome browser extension and the trading is done in the cloud, so you will need to have the Chrome browser installed in order to be able to use this automated trading bot. The Butterbot is a commercial product that works in the cloud, so as soon as you purchase the product you will also need to pay a small monthly subscription fee. This however is a good option, because you don’t have to have a computer on all the time with the bot installed on it, it will work automatically as soon as you activate it and set the trading parameters and you only need a computer to be able to monitor what the actually bot is doing or to change the trading settings. The best thing about the automated exchange trading of BTC/USD that Butterbot does is that it supports three of the major BTC exchanges – MtGox, BTC-e and Bitstamp and the bot can operate on all three exchanges with independent settings or only on one or two of them, it is up to you. Furthermore there is a7 day free trial that you can activate in order to test the automated trading bot, before you decide if you should pay for it and start using it on the long run. And while these 7 days to try it out are a great feature, this bot may not give very good idea if it will be profitable on the long run as it is designed to be used for longer periods of time and the results you get may not only vary based on your trading settings, but also on the current market situation and the trading on the exchanges. For the moment the Butterbot supports only BTC trading, but the author of the trading bot is apparently also working on Litecoin (LTC) support in an upcoming update with the feature already available in beta. This is definitely a good thing, because it can increase your profitability chances by operating on more trading pairs than just the standard BTC/USD ones that are currently supported. We’ve decided to give the Butterbot a try for the 7 day test period before deciding if we should start using it on the long run and we are going to share our results from the product during or trial period. We have started with a small sum of about 25 USD in the BTC-e exchange, it is good to start the test with a small amount on a single exchange to get a feel of the interface of the product and to minimize the potential loss if you mess up or you are not happy with the results you get from the bot at the end of the trial period. – 30 minute time window. We started with the recommended settings for BTC-e and already a day has passed with the bot active on the BTC-E exchange with a starting capital of 25 USD to operate with. 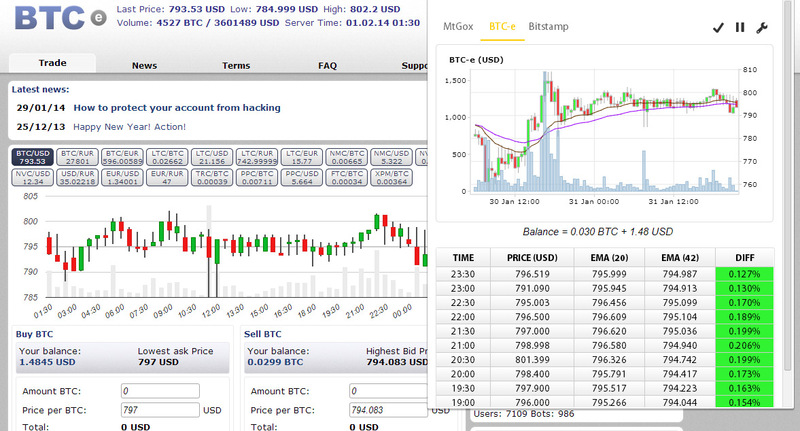 So far the bot has executed just a single trade – it bought 0.03 BTC, so at the moment our balance is as follows: Balance = 0.030 BTC + 1.48 USD. We also noticed that the bot has not acted on some possible opportunities, so while the recommended settings may be well balanced for start they will need some tweaking for better profitability. For now however in just day it is hard to give any positive or negative feedback about the bot, so stay tuned for more of our testing results with the Butterbot automated Bitcoin trading bot in the next few days as we continue to test how will it perform.